This is a sponsored post written by me on behalf of Cottonelle®. All opinions are 100% mine. Potty training is a love-hate relationship with every parent. We can’t wait for them to be out of diapers but cringe at the process of starting to potty train. Now every parent will have a different potty training story, some were easy and some not so easy. My husband and I, just finished potty training our youngest and she wasn’t as easy as our first child. We’ve learned a lot after potty training two kids and wanted to share with you a load of practical potty training tips that we learnt the hard way so that you can come up with an approach that works best for you and your child! 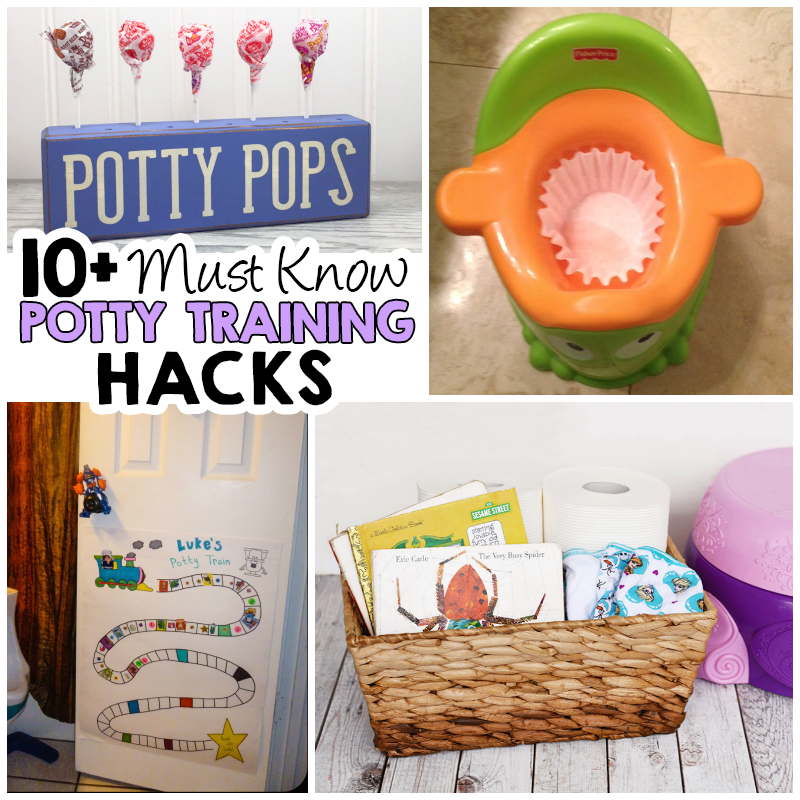 Here are 10+ of the best ever potty training tips and tricks to simplify your life. Start introducing potty themed books at bedtime. The best way to start the transition to potty training is by communication. Try introducing some potty themed books in at story time to get them familiar with it. Here’s a list of some popular Books For Potty Training to give you some ideas on what books to include. When they’re successful, celebrate! You can offer something like these potty pops, sing and dance, and have a potty reward chard that leads up to a big prize when they’ve had so many days potty trained. 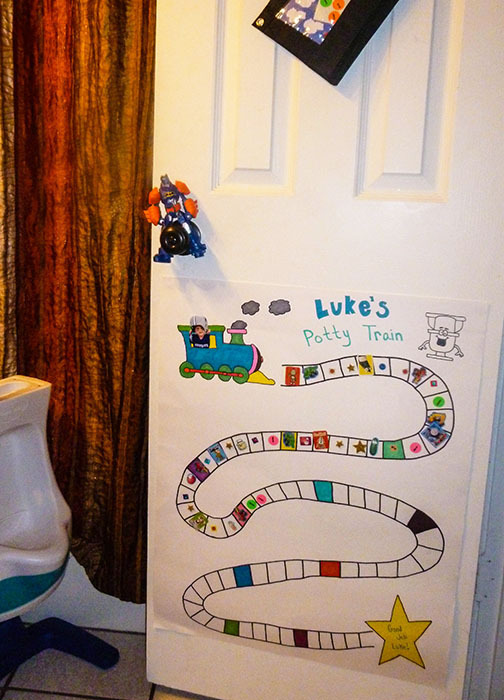 This reward chart I came across on Pinterest, although there’s no source I thought the idea was cute with a personalized train with your child’s picture on it to hang on the bathroom door. Be consistent. You need to get used to saying the phrase “Let’s to go potty” a lot. The best idea is to set a timer on your phone to go off every 20 minutes – 30 minutes for potty breaks. It sounds like a lot but in those first few day it’s better to go more frequently than needed. Dress casual. Don’t put them in overly complicated clothes because they’re going to be removing their clothes on their own a lot those first couple days. Stick to one layer to help them get to the potty easier. 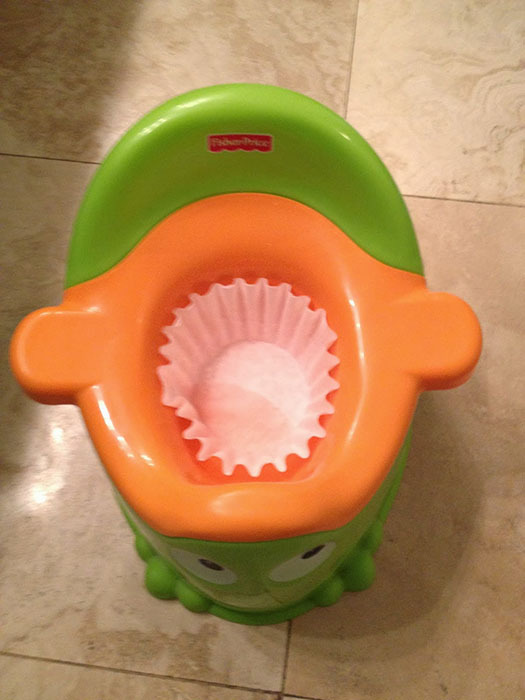 Make it easier to clean up poo by using a coffee filter. Of course you don’t want to flush this, just throw them in a diaper pail. Nighttime Potty Training. When it comes to nighttime potty training make sure to limit liquids before bed, use the restroom immediately before bed, and buy a couple good mattress pads. How to remove pee stains from your mattress with this simple recipe. If you’re potty training, accidents are bound to happen sooner or later. At least with this easy recipe you’ll be prepared! 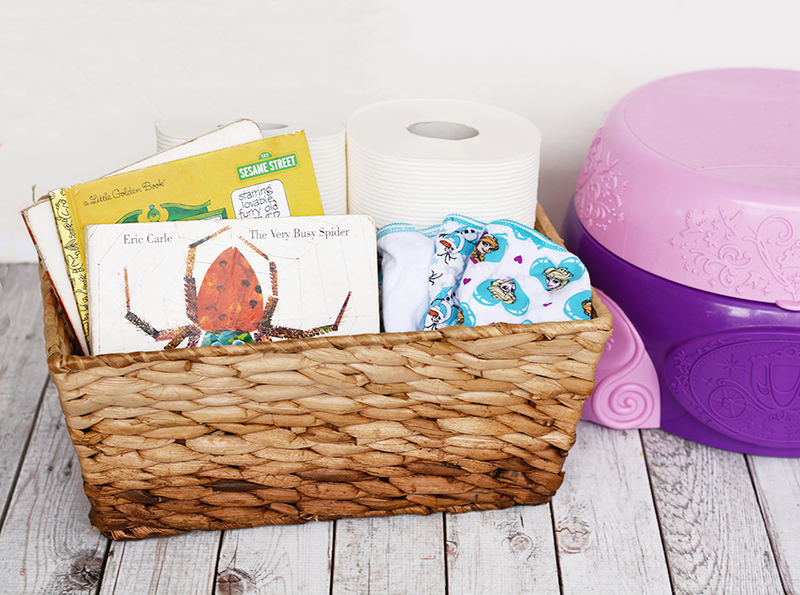 Keep potty training essentials near the potty. Trust me when I say these essentials will come in handy like board books and extra underwear. I like to keep all of the essentials in a little basket so they’re there in case of an emergency. I always keep things like board books, extra underwear, and Cottonelle® Mega Roll with CleanRipple Texture. 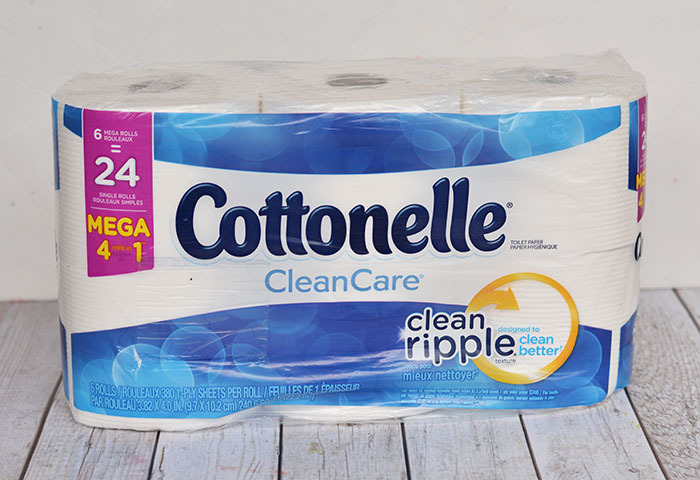 With Cottonelle® Mega Roll with CleanRipple Texture, there’s more inside that meets the eye. Each roll holds 4 rolls in 1 to enroll a mega surprise. With more sheets per roll I don’t have to stress because my kids are still wayyyy overestimating how much toilet paper they need. Plus, with more sheets in each Cottonelle® Mega Roll that means less changing the roll and less hassle. Unroll a mega surprise and save $.75 here. 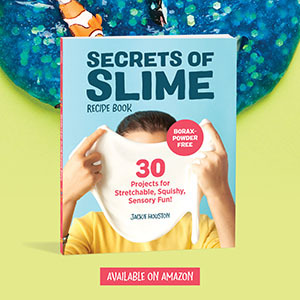 Looking for more tips on potty training? 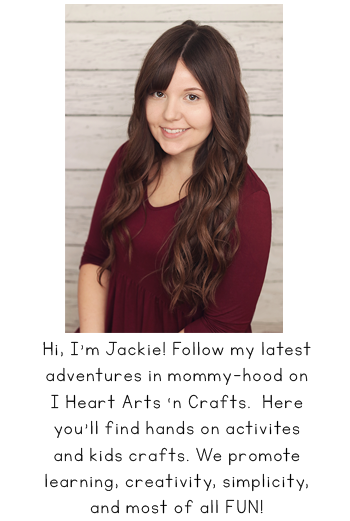 Cottonelle® has teamed up with lifestyle expert Brit Morin to provide families with even more ways to save time and space. Check out all of her amazing potty training tips and tricks below! When potty training doesn’t happen in that few days and progress seems slow and hard, don’t give up! Just adjust your expectations, give it time, and try to be patient. Hang in there, it will happen! Stay tuned to the Cottonelle® Facebook page for more great tips and tricks!